'The Duke is a great new venue for us, with increased time, better facilities, massively greater accessibility and free entry. Together with Jamtone and special guests tbc. we will present a party night of Jamaican music, from 9.00 until 2.00. 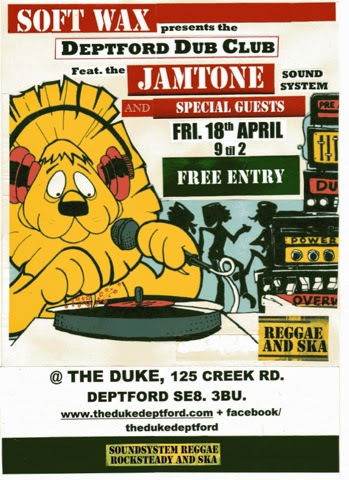 For this session the tunes will be spinnin’ on Jamtone’s full traditional Sound System rig, enabling them to be appreciated to full affect, in a “back-a-yard” style. Strictly Roots Reggae, vintage Rocksteady and Ska. Expect special guests singers and players on the mic. too. Darren Jamtone has been the mainstay of Sound Systems for two decades. He is now an accomplished live and studio Sound Engineer too, with many records to his name. Steve Wax has been carving out a unique niche as an installation DJ. Together we’ll be selecting a blistering mix from Blue Beat through to “one away”, contemporary, roots rock Reggae.